With more than 1,000 weekly flights, customers have more flight options between Mexico and the United States than with any other carrier. Plus, they can reserve, buy and fly on either airline – giving them even more flexibility. 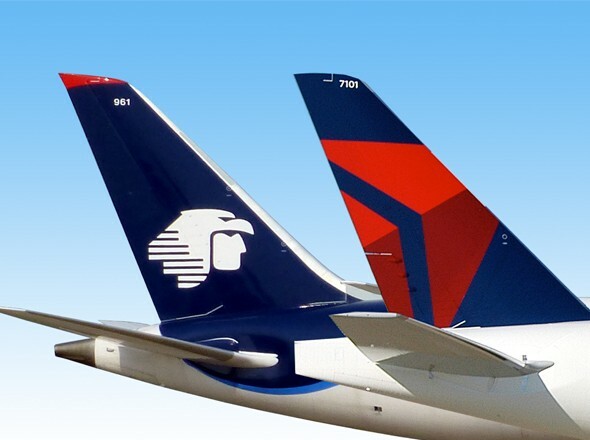 The combined schedule includes 19 daily roundtrip flights to Mexico City from Delta’s hubs, with Delta codeshares available on 73 routes to 40 cities in Mexico. Complimentary access to Delta Sky Clubs and Aeromexico Salon Premier Lounges for Gold, Platinum and Diamond SkyMiles members, Platinum and Titanium Club Premier members and passengers travelling in First Class or Business Class. They also benefit from priority check-in and boarding. Co-located flights at international hubs including Mexico City, Monterrey, New York-JFK and Los Angeles, make it easier for customers to manage their travel plans including any last-minute flight changes. First Class and Clase Premier passengers enjoy chef-curated meals and a personalized service, with everything they need for a comfortable onboard experience. All flights feature Wi-Fi connectivity and a wide-range of on-demand, complimentary entertainment for all passengers. There are more opportunities for customers to earn miles whether they fly with Delta or Aeromexico thanks to full reciprocity for mileage accrual and award redemption. Our comprehensive, fully integrated network and competitive prices enable you to meet your customers’ travel needs, wherever they need to fly in Mexico or the U.S. Meanwhile our Sales Account Executives are working together to simplify account coordination, providing you with the best service.